The Plaza De Toros El Cortijo was a bullring based out of Mexico City. 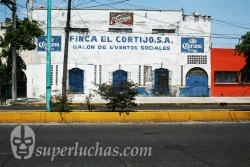 El Cortijo hosted lucha libre events during all its history. It was demolished in 2015. Address: Damasco 55, Col. Romero Rubio, Mexico City. This page was last edited on 23 December 2015, at 19:36.